Quaternions extend the concept of complex numbers, just as complex numbers extend the concept of real numbers, so it helps to start with a review of the complex numbers and the complex plane. Where c is a complex number, a and b are real numbers, and i is the infamous square root of -1. Which means complex numbers are inherently two-dimensional. 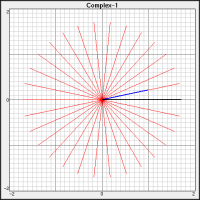 To actually plot a complex number, we just ignore the i part and plot the two real number parts as x and y. What matters here is that the behavior of i creates an interesting property when it comes to multiplication of two complex numbers. Specifically, if a complex number is considered as a vector with its tail at the origin (0,0) and the head at the coordinates, then a complex number also has an angle with respect to the axis. So the complex plane allows easy rotation of points around the origin. Just multiply the points by some unit vector complex number with the desired angle. Complex numbers let us do interesting things on the complex plane; quaternions let us do interesting things in three-dimensional space. Where a, b, c, & d, are real numbers, and i, j, & k, are special “imaginary” numbers (secret sauce). Used like this, the complex numbers give the three-vector some special properties: the ability to rotate points in 3D space. Complex numbers allow rotation in a plane, and three (interlocked!) rotation planes give us rotations in 3D space. If you think about how a point in 3D space projects values onto the X, Y, & Z axes, then you can perhaps imagine how a rotation in 3-space projects rotations onto X, Y, & Z (complex) planes. Now, here’s where it gets a little weird, and this might be the stumbling block that challenges people about quaternions. The quaternion complex coefficients, i, j, & k, just like the i used in the complex numbers, each have the property that their square is -1. Now, if you let that sink in, it almost doesn’t make sense. One gets — or at least I got — the impression that j and k were just placeholder names for i, that all three were the same thing. That their squares all give -1 sure makes it seem that way. But it’s not that way. They are completely different magic numbers that share properties with the good old i from complex numbers! It may help to understand that these are basis vectors — orthogonal axes — on different complex planes. It’s exactly like how X, Y, & Z axes are orthogonal to each other even though they’re all represented by real numbers. So think of i, j, & k, as three different flavors of “magic sauce” for the X, Y, & Z axes, respectively. Table 1 (right) shows the multiplication table for quaternions (but there’s an easier way). To understand how it works, it’s again helpful to start with complex numbers. Where a, b, c, & d, are all real numbers. The trick here is that the i2 resolves to -1, which provides a scalar (which is added to the scalar product). Meanwhile the two terms with i add to provide the “imaginary” part of the new complex number. It looks like a mess, but only that final equation matters (I just showed how we got there). It can easily be coded in any (adequate) programming language. Quaternion addition (or subtraction) is member-wise, so that’s simple. Quaternions have all sorts of wonderful mathematical properties (that are utterly beyond me), and they apparently have a strong connection with Special Relativity in being 4D numbers. The reals (ℝ) are necessary in general science. The complex numbers (ℂ) are necessary in physics. The quaternions (ℍ) are useful in SR (I’m told). The octonions (𝕆) might be useful in quantum physics. The real numbers aren’t tamed by algebra (because of transcendental numbers). The complex numbers aren’t ordered (no sort for multi-dimensional numbers). The quaternions aren’t communitive (a×b ≠ b×a). The octonions aren’t even associative ([a×b]×c ≠ a×[b×c]). But what interested me — and which might interest a lot of programmers — is this: How the heck do you rotate something with a quaternion? P’ is the result of rotating P, the point we want to rotate. Note that P, in reality an [x, y, z] coordinate, is expressed as the quaternion: [0, xi, yj, zk]. Q is the rotation quaternion, and Q-1 is its inverse. It was confusing descriptions of this process that made it hard for me to figure out what was really going on. To some extent, it was all the extra information that made it hard to absorb the key aspects. Once I filtered out the stuff real mathematicians need to know about quaternions, it turned out to be fairly simple. It really does boil down to sticking a [x,y,z] coordinate into a quaternion with its real part set to zero. Then multiply the rotation quaternion by the point quaternion and then by the inverse of the rotation one. The resulting quaternion has the new [x,y,z] in its vector part. Easy Peasy. Part of the trick is the rotation quaternion and its inverse. First pick the rotation vector. Find the [x, y, z] that, as a vector, is the rotation axis. If necessary, normalize it so it’s a unit vector. Then pick a rotation angle, the number of degrees to rotate whatever is being rotated. As a simple example, assume we want to spin something like a top, about its vertical axis. And let’s say we want to rotate it five degrees (5°) each step. The unit vector here is simple; it’s just [0,1,0]. Let’s include a second example with a non-orthogonal angle: [+10,-3,+5]. We need to take the unit vector of that: [+0.864, -0.259, +0.432]. Where Q is the rotation quaternion, V is the rotation vector, and θ is the rotation angle. We also need Qrot-1, the inverse, or reciprocal, of Qrot. For quaternions, this is defined as: Q* ÷ |Q|2. That is, the complex conjugate of Q (notated as Q*) divided by the squared norm (aka magnitude, notated as |Q|). The complex conjugate of a quaternion, as with a complex number, just inverts the complex parts. For a quaternion, Q* = [a, -bi, -cj, -dk]. Note that this moves one point one step. To rotate all the points of an object, apply the rotation quaternion to each point. To rotate an object multiple steps (in a complete revolution, for instance), keep rotating the points. The example above steps 5°, so 72 steps makes a complete revolution. They are well worth checking out! This entry was posted on Tuesday, January 22nd, 2019 at 9:19 am	and tagged with complex numbers, math, math theory, mathematics, natural numbers, number systems, numbers, octonion, quaternion, real numbers and posted in Math, Sideband. You can follow any responses to this entry through the RSS 2.0 feed. I think i just rotated to the point where my head spun off! Laugh. Awesome. FWIW, I made this movie using a quaternion class I made in Python. The 3D rendering is just a simple transform of XYZ to XY that I wrote to produce the images. The rotation is generated through quaternion multiplication as explained in the post. The red, green, and blue vectors show the progressive rotation. (Notice how the blue vector and the blue box match.) The gray one just sums the three individual vectors. 😀 We were talking about the math behind GR recently… this is easier! I’m still chewing on tensors (and finding it a tough go). But I’ve never run into them in any text or video on Special Relativity. They are 4D numbers, so I guess they could be used to plot Minkowski space, but I have no idea how the complex coefficients apply to SR. I keep meaning to do some searching on that. Don’t know if you’ve heard of Cole Furey and the work she’s doing applying octonions to the Standard Model. As you know, QFT is a gauge symmetry theory, and is entirely mathematical. There is a search for an underlying mathematical framework that gives rise to the SM — you might have heard of Garrett Lisi’s work with the E8 group, a similar pursuit. She did a video series that’s pretty interesting. A lot was over my head, but what I got from it gave me a lot more insight into the mathematics behind modern physics. If you’re looking to chew on something really meaty, it’s worth a look. Bunch of really short videos. Thanks. That video is interesting, but this would be too high a mountain for me to climb right now. I would like to understand the mathematics at some point, but it’ll probably have to wait until after I’m retired. It does make a huge difference. Not just the free time, but the freedom from work stress is wonderful! I’m definitely looking forward to the freedom from work stress part! I really had a hard time going back after the Christmas break. And the MLK weekend didn’t help. Ah well. 17 months to go! Have you made a chain to cut links off or a calendar to mark days off? Ha! Not yet. Actually I’m thinking if I dwell on it too much it will feel longer. Eye of the beholder, obviously, but it seems to work the opposite way for many. People urged me to do it, which is why I tried it. I liked it. I think the trick is to set it up so you see a growing pile of days you’ve checked off and a shrinking pile of days left. I just took an image of a calendar and every so often went in an colored out the days behind. Had a link to the image on my desktop, so I could pop it open any time. On some level you always know how much time there is, but seeing it seems to make it more real than prolonged. But your mileage may vary. Hmmm. Ok, thanks! I may have to give it a try. Today would have been a good one to cross off. I had a lot like that near the end.